Why buy a boring, reliable ride when you can get a slightly older, slightly rougher used luxury car for less? 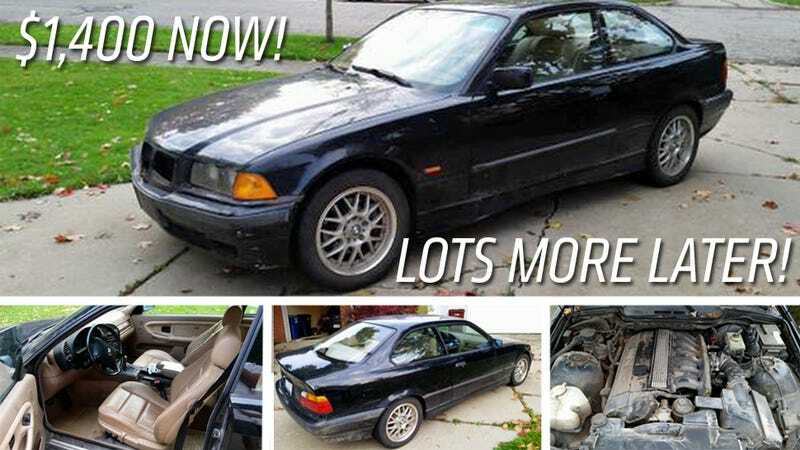 Just ask the ambitious and hilariously honest seller of this '99 BMW 328is, who's throwing in the towel after realizing a $1,500 rally car can be anything but "cheap." We see about a hundred "creative" Craigslist ads every week and we're really tired of hearing "are you man enough to buy this Jeep?!" but there's a great tragicomedy story here, and I know we can all relate to "taking on a bigger project than we have any right to be messing with" at some moment or other. This is not to say all used luxury cars are a bad buy, especially if someone who's good on the tools is doing the buying. But the ocean of Craigslist deals is full of icebergs, some can be chalked up to "learning experience," some are just unfortunate moneypits. Imagine for a moment that you had $1500 to buy the best two wheel drive rally car you could.What would you choose? ...an 80's 300ZX?...maybe you don't like to go fast, so you'd rather a nice MR2 or Miata...or maybe you REALLY don't like to go fast...well there is always a Ford Festiva! Unfortunately, those are all the wrong choices! The best rally car on a budget is the BMW E36! And if you can manage to get the 328is model, the only thing to worry about is handling the POWER!!! Now picture yourself being a cheap but overconfident BMW fanboy. Someone just offered to sell you the above mentioned future rally car for $800, the only catch is it doesn't run and needs a couple odds and ends...lets say intake gaskets and a new grill. You would buy it instantly! Then imagine taking it home, pulling it apart and finding out that by intake gaskets they meant cracked cylinder head with serious emulsion issues! You would only really start to cry when you found out that a good used engine would cost another $800 and a road trip to Fort Wayne. Cool right...the pain is over...NOPE! Next it was the alternator, windshield wiper mechanism, full brakes, cam sensor and a bunch of other odds and ends. Well now it seems that you have well over 2 grand in your "$1500" rally car and oh yeah lets not talk about the 100 hours of labor and the fact that the front dampers failed to function at least 100k miles ago. To your friends, you would try to deny that this was the dumbest purchase of your life, while you tried to highlight the few good features it has. In all this negativity we almost forgot that this is a BMW - THE ULTIMATE DRIVING MACHINE!! A silky smooth inline six combined with a proper manual and RWD...there's nothing better! The car would ultimately perform mid-pack, because while you spent all of your time trying to get your damn expensive high maintenance German Fahrmaschine to run your friends optimized their sub-optimal choices. True story. This is my life. This car is now a reliable pile of crap that I've stuck a lot of money in. After the challenge, it has been sitting in a garage all winter with a dead battery and load of scrap in the trunk. The problem is that I hate this car so much that I can't even go into the garage anymore. And lucky you (the reader) this car is now FOR SALE!!! Don't miss out on your chance to own a piece of history! I've got all the old broken parts and even a set of M3 wheels that are negotiable. This would make a great beater, lemons, chump, rally or track car, but it should go without saying that the future owner should be mechanically inclined. Please don't call and ask me for a carfax...I'm sure the carfax is great on this car...which is not at all representative of what you are getting. Please come take Brandi to her new home...if you're lucky I might even help you jump start her. Thanks for showing us this, Kevin!